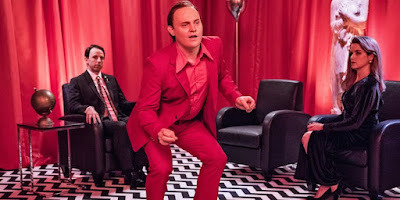 Blue Rose Epics | Entertainment: Late Night Twin Peaks Parody! Late Night with Seth Meyers has some fun pretending to make a talk show inside Twin Peak's famous Red Room, and it is surprisingly funny and engaging. I know this is a joke, but I want an actual talk show like this now. Along with the recent WWE parody, it looks like parodying David Lynch and Mark Frost's surreal masterpiece is all the fashion nowadays and we Peakers should revel in every glorious moment of it. Kudos for the technical team mimicking the same film techniques used to bring the original Red Room sequence to life. This is a worthy addition to the Twin Peaks Parody Pantheon. I just wish the sketch ran even longer and it was a permanent fixture of the show.